CirqueEloize: Hotel (c) Pierre Manning. Contemporary Canadian circus Cirque Éloize are celebrating their 25th birthday this year with the UK premiere of their new show Hotel. Set in an Art Deco hotel audiences are set to be wowed by 12 acrobats and musicians who perform physical feats and dazzling tricks as the tourists and travellers sneak behind the scenes of the hotel. Featuring an original score by Éloi Painchaud, Cirque Éloize show off their trademark blend of circus and drama in a place that never sleeps. The visually impressive Art Deco hotel full of chrome surroundings and bright lights is a great setting for this innovative show. Unlike other circus productions Hotel blends a mixture of dance, comedy, music and acrobatics to create a fresh take on the traditional circus. Although mostly aimed at adults, this production is well-suited to all ages and families will enjoy this unique show. The disciplines are all expertly performed from the dare-devil Aerial Rope to the clever Cyr Wheel. The Chinese Pole and Hand to Hand acrobatics are performed with precision and clarity. Whilst the show lacks pace during some overly long sections, it comes together during the energy-driven moments when all of the 11 cast members perform and have the chance to show off their undeniable talents. No circus is complete without comedy and Cirque Éloize’s Hotel manages to replace the traditional clown character for the bumbling, awkward hotel owner, played by Antonio Wicky, who along with a mixture of hotel workers and guests provide lots of comic moments. For those who have seen other recent circus acts there are few surprises in this production and unfortunately, some of the stunts lack the nail-biting tension seen in other shows. However, the sheer strength and control that the cast members have over their bodies is amazing to watch. The Slack Wire, for example, is a skill not often seen and was performed effortlessly by Jérémy Vitupier. All of the cast are clearly experts in their areas and perform gracefully and with conviction. What makes Hotel different from other similar circus shows is its unique use of live music. Sabrina Halde’s endearing folk, indie vocals mix well with the contemporary show to add dynamic. The songs, written by Éloi Painchaud, mostly fit the show and add an element of storytelling. As this troupe originates from Montreal, Canada it is nice to see both French and English being spoken and sung. 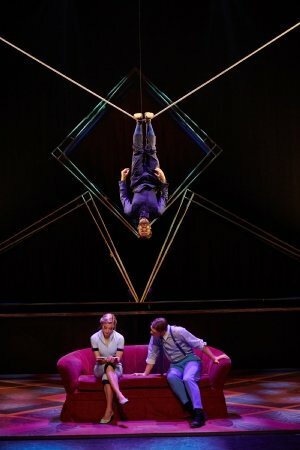 Overall, Cirque Éloize’s Hotel may not offer anything overwhelmingly shocking or new but what it does offer is a clever fusion of dance, acrobatics, circus skills and music to create something fresh. With an outstandingly talented cast, it is an entertaining show to sit back and enjoy whilst marvelling at the feats performed onstage. Check in for a night of spectacular circus from Canadian contemporary circus crew, Cirque Éloize. Sneak behind closed doors of the grand Hotel to witness the intimate stories of tourists and travellers, the famous and infamous, guided by the time-spinning groom and the artful maître d’hôtel. Featuring astounding physical feats, dazzling tricks and daring stunts, performed by 12 acrobatics and musicians Cirque Éloize show off their trademark blend of circus and drama in a place that never sleeps.